Yes, I'm tired. It's been a busy (but good) weekend, although it has included a fair portion of shopping and cleaning the house, which, whilst certainly needing to be done, doesn't quite get me excited. Plus, I've had to water the garden. I have a certain opinion about the garden. I believe that as the garden is essentially nature, and nature has the rule "survival of the fittest" where elderly and infirm animals are generally eaten by a wolf (or me), that plants shouldn't need watering. If they need watering on a regular basis, I do think that they ought to be left out to die as they clearly aren't suitable for their location. You wouldn't put a sunflower in a cave and then take a sunlamp in there to give it the light it needs to grow, so why water plants every day? Of course, it isn't as simple as that - the plants do indeed look nice (certainly nicer than if I did leave them to their own devices), and all through the winter don't really need any maintenance so five minutes with the watering hose (which has a rather cool gun attachment) isn't overly onerous. If you haven't noticed, the summer solstice was yesterday. Putting aside the theological aspect of this day, basically it means that we're heading for winter and Christmas now. Having baked myself whilst driving this afternoon I can't say that it really feels as though winter is coming, but nevertheless it is. I just wish that it had come soon enough to keep the beer on my desk cold. I have published a new video today, with some reviews of alternative milks - as part of our bid to become healthier, the family have given up cows milks. While in the video I do talk about oat milk as being my favourite, we are actually now all on almond milk, and I must say that it is very nice indeed. Finally, whilst mucking about on my YouTube channel (I'm on 48 subscribers and 9,942 video views - I'd love to make those figures up to 50 subs and 10,000 views if you feel the need!) 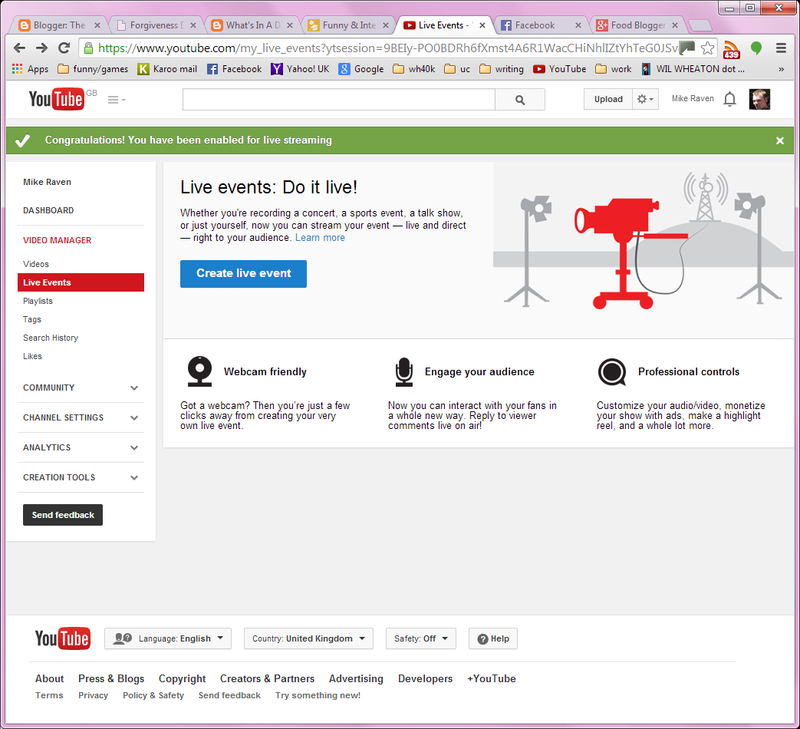 I noted that I could enable Live Events. So, I can now do live events. I have no idea of any live events that I could do, or even if I did do an event whether I'd do it on YouTube or on Twitch, but it's nice to have the option. If anyone does have any ideas for live events, or video collaborations, or indeed blogging collaborations, do get in touch, I'm always keen to hear from people and work together on stuff. It makes this creating thing fun.